We operate a Custom Shop. We can super charge your drums with new Edges, Tom Mounts, Hoops, Spurs and Recovering. We also provide Repairs, Tuning and Restoration of your Vintage Drums. We can also modify your drums with new tom mounts, spurs, hoops and throw-offs. Bring new life to your vintage or damaged drums with our repair and restoration service. Give your drums a new look with our recovering service. 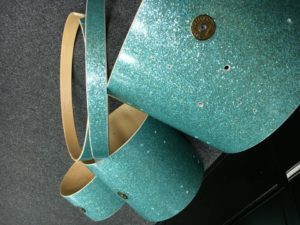 We can wrap your drums in the most popular Pearl and Sparkle wraps. To see our offerings of coverings, go to our Laminate Wraps page.